The benefits of bananas are numerous. They're healthy for the body, skin, hair and scalp. The edible inside and outer peel both provide health benefits. The banana plant is a large flowering plant with spiral shaped leaves. It's main stem can grow, approximately, twenty feet tall. It's often mistaken for a tree but has no woody parts. It thrives in hot and sunny conditions, although afternoon shade is welcome. The large leaves can tear, easily, in high winds. 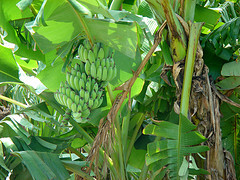 Bunches of bananas are produced in large hanging clusters. The banana peel is the outer protective layer of the inner edible portion. Eat ripe, organic, bananas. Blend in smoothie, slice on sandwich or across your favorite cereal! Bananas have higher calories compared to other fruits, so be conservative and eat a healthy portion. Bananas should be firm and free from bruises, dark spots, or marks. They should have a bright appearance. Discard brown bananas. Store unripe bananas at room temperature, not too hot or cold. To quicken the ripening process place in a paper bag or wrap in newspaper with an apple. Ripe bananas can be placed in the refrigerator. Bananas can be frozen and kept for approx. 2 months. Remove peel and cover in plastic wrap. SOOTHE DRY ITCHY SKIN: Bananas have anti-inflammatory properties, soothing for dry itchy skin, like poison ivy. They have minerals and antioxidants soothing for psoriasis and eczema. REDUCE FINE LINES & WRINKLES: Bananas have anti-aging properties which help prevent the reformation of fine lines & wrinkles. They boost collagen levels. YOUTHFUL APPEARANCE: Bananas detoxify the body, increase skin circulation and have benefits of vitamin C. Benefits of vitamin C, for skin, include: speeding recovery of minor wounds, cuts, incisions and burns. Vitamin C protects skin against fine lines and pre-mature wrinkling. -- PREVENT SAGGING: Peel ripe organic banana. Mash inner portion to a pasty texture. Add small amount of organic honey. Mix well. Apply mixture to face, avoiding eyes and areas of sensitivity. Rinse well with water. Gently pat dry. This homemade facial helps nourish and firm skin. -- SOOTHE DRY SKIN: Mash the inner portion of a ripe, organic, banana. Mix well with natural yogurt and a small amount of organic honey. Apply mixture to face. Avoid eyes and areas of sensitivity. Let stand for approximately 5 minutes. Rinse with warm water. Gently pat dry. This homemade facial soothes skin. -- GET RID OF BLACKHEADS: Rub the inside of a ripe organic banana peel on the affected area. Bananas have anti-bacterial properties and high potassium content making them ideal for treating acne prone skin. The spread of bacteria in skin cells is diminished allowing pimples or blemishes to heal at a faster rate. -- NATURAL GLOW: Drink smoothies with bananas and other fruit. Use different combinations. Blend bananas with strawberries, blueberries, pineapple, oranges, mango. Boost benefits of vitamin C and antioxidants! Peel one banana. Cut inner portion into small slices. Place inner portion into blender. Add sliced strawberries. Add small ice chips. Add orange juice. Blend all ingredients until desired texture. Enjoy a drink full of vitamins, minerals and antioxidants! Peel one banana. Cut inner portion of banana into small slices. Add almond milk, spinach, banana slices, blueberries and raspberries to blender. Blend all ingredients until desired texture. Enjoy an antioxidant drink full of vitamins and minerals! Peel one banana. Cut inner portion of banana into small slices. Add coconut water, banana slices, apple slices, strawberries, spinach to blender. Blend all ingredients to desired texture. Enjoy an antioxidant drink full of vitamins and minerals! Peel one banana. Cut inner portions of banana, mango, kiwi, pineapple into small slices. Add coconut water, banana, mango, pineapple, kiwi, strawberries, spinach to blender. Blend all ingredients until desired textured. Enjoy an antioxidant drink full of vitamins and minerals! Make YOUR own smoothie recipes. Try blending a different variety of fruits and vegetables. Smoothies are cold delicious antioxidant drinks, especially in the hot Summer months! Improve hair and scalp conditions. Use shampoos or conditioners with banana oil. Soften hair, increase elasticity, moisturize, increase hair shine, prevent split ends and get rid of dandruff. Improve dry or flaky scalp conditions by retaining moisture. Bananas have nutrients, vitamins and minerals to help manage hair.